The Process Control chart shows how much time on average your tasks have spent in a given stage. The Process Control chart only takes into consideration those tasks that have exited the column - the results you get are based on the historical data in the system and how much real time it took for your team to complete the tasks. - How much time on average our tasks spend in progress? - How much time on average do we need to test the new feature? - How much time on average do we wait for customers to respond to my questions? The appropriate board structure (workflow) is of a major importance for the reliability and accuracy of the results generated via the Process control chart. The first necessary condition is to create the stages in your working process - edit your workflow and create the columns accordingly. technical design column | review column | coding column | ready for testing column | testing column | production/done column. Each column reflects a specific step in the process. The second important condition is the classification of the tasks. This is visualized via the swimlanes in the board. Each swim lane can be considered as a separate category of work. To generate a Process Control Chart, which is relevant to your needs -> use the Filter panel at the left side of the module. Choose which columns and swimlanes you want to see in the chart - tick them off (for example- column is: coding; lane is: bugs). - How much time on average you need for coding a bug. 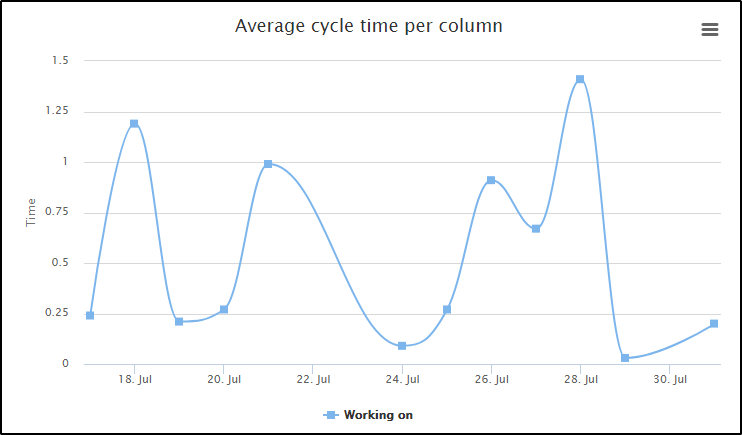 - How much time on average you need for coding a new business feature, etc. The image below provides a summarized information for a week as the data is aggregated by weeks. 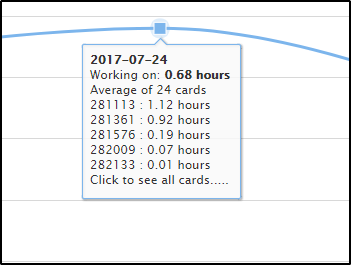 It states that 24 cards passed through the "Working on" column on the board and it took on average of 0.68 hours for each card to be processed. If you click in the box, the system will generate a list of all the cards, so that you can investigate further, if necessary. At your Process Control chart, select the “Show as Histogram” check box, then your filtered data by the specific columns and lanes and within the selected time range will be displayed as bars. Each bar refers to a measurement of how many tasks have cycle times within a fixed time period. The aggregation period could be selected further more to be in days, weeks, months or years. The histograms are often used for predictability and planning purposes. It’s very easy to spot the peak of your chart (the highest bars), which are the ones containing the most cards with similar cycle times. Presumably, if you now push a new task into your process, there is a high probability of your new task cycle time to end up in that particular range of bars. If your workflow is smooth and running in a good predictable manner, you should have a shape of a bell with its peak where the most likely cycle time is. If you have some deviations, you would be able to easily spot them. Usually, those are on the left or right side of your bell curve. A simple click on that “deviation” bar will show you all the cards involved and you could then go further and investigate why that happened.